Bischoff, A., Barrat, J.-A., Bauer, K., Burkhardt, C., Busemann, H., Ebert, S., Gonsior, M., Hakenmüller, J., Haloda, J., Harries, D., Heinlein, D., Hiesinger, H., Hochleitner, R., Hoffmann, V., Kaliwoda, M., Laubenstein, M., Maden, C., Meier, M. M. M., Morlok, A., Pack, A., Ruf, A., Schmitt-Kopplin, P., Schönbächler, M., Steele, R. C. J., Spurný, P. and Wimmer, K.
The Stubenberg main mass and other found specimens of this fall were presented for the first time at The Munich Show (28-30 October 2016) at booth A5.431. On 12 May 2016 Stubenberg was officially registered as LL6 (S3/W0) in the Meteoritical Bulletin Database. History: (Pavel Spurný, CzAS). 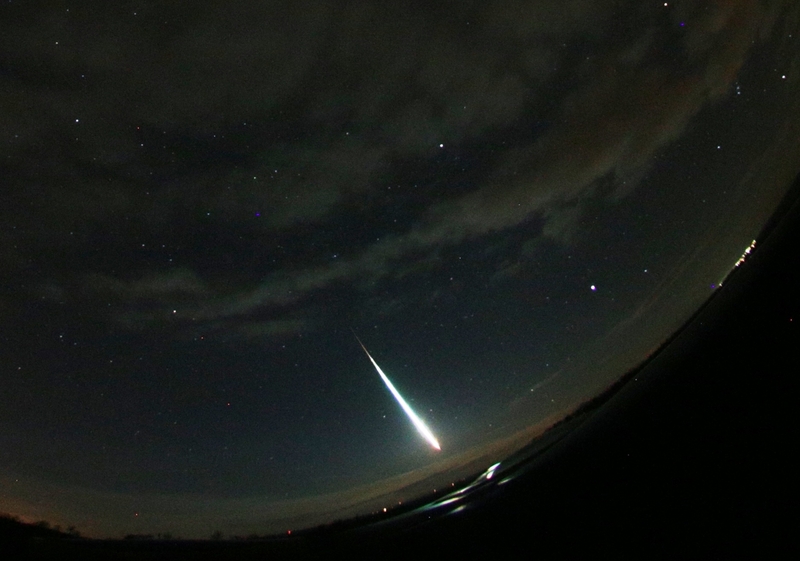 A very bright bolide was observed by thousands of eyewitnesses over Austria, Germany and the Czech Republic on March 6, 2016, at 21:36:51-56 UT. 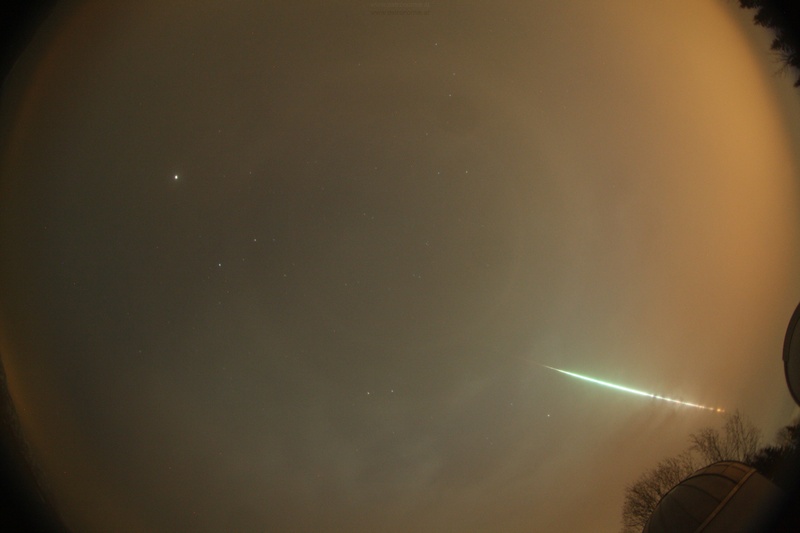 It was recorded photographically and photoelectrically by digital all-sky fireball observatories at six Czech stations of the European Fireball Network. A digital photographic spectrum of the bolide was also obtained. Based on these instrumental data, precise results on atmospheric trajectory, heliocentric orbit, and fragmentation history were quickly determined. From this analysis it was evident that this event likely resulted in multiple stones falling: the impact site was modeled and sent to German colleagues four days after the fall. 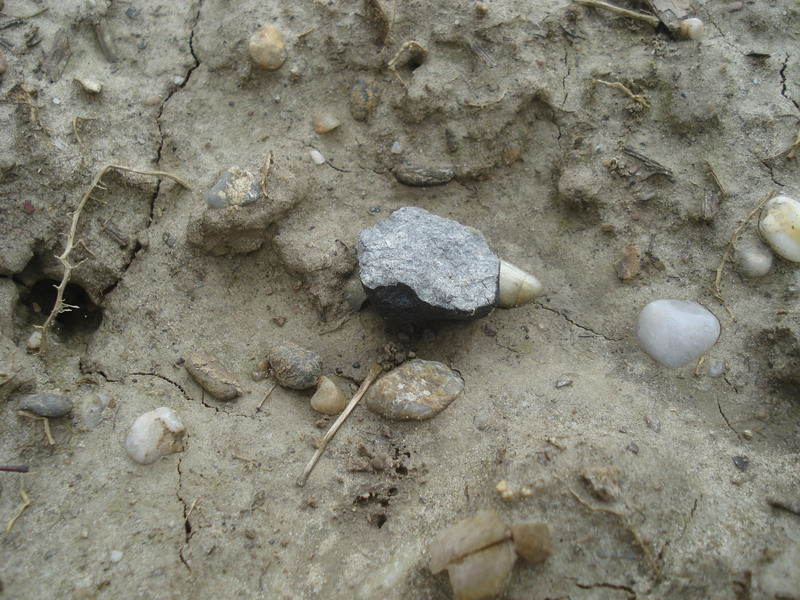 All of the meteorites were found in the predicted location for a given mass. Physical characteristics: (D. Heinlein). 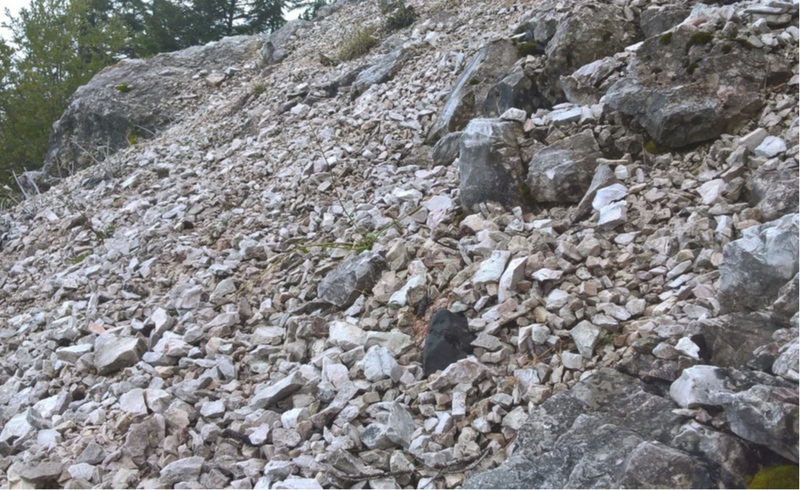 A total mass of 1.473 kg was recovered within the predicted fall site. 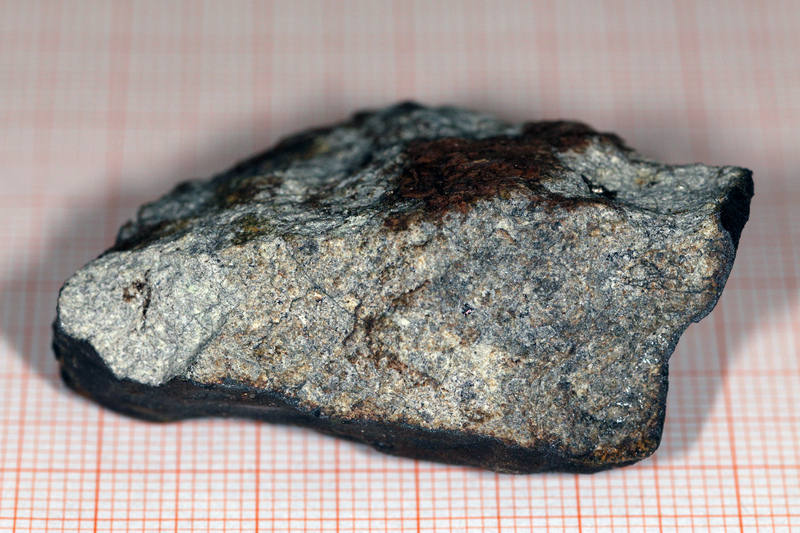 The largest fragment has a mass of 1.320 kg and was found in a 14-cm-deep impact pit. The remaining 153 g of material consists of several pieces resulting from five different fragments. 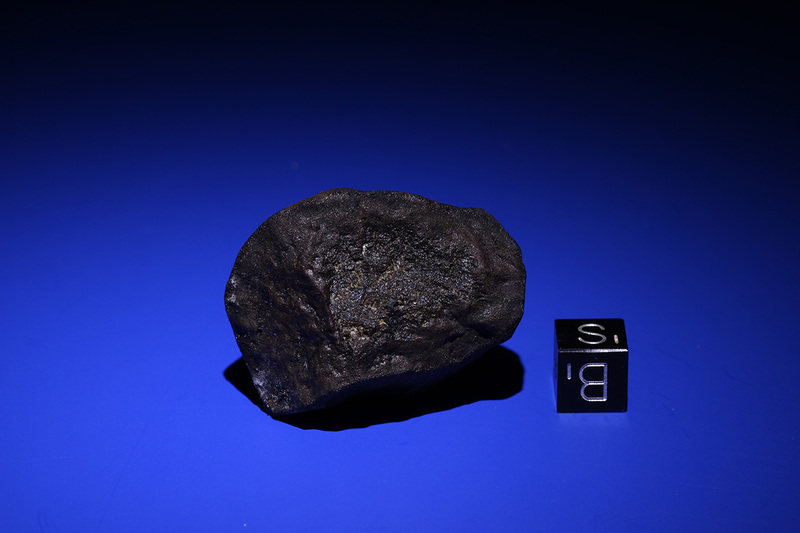 The first meteorite, 48 g, was found six days after the fall: it was broken into many pieces after hitting a hard surface. The other recovered fragments have masses of 42, 36, 19, and 8 g.
Petrography: (S. Ebert and A. Bischoff, IfP). Based on the study of the thin sections, Stubenberg is brecciated. 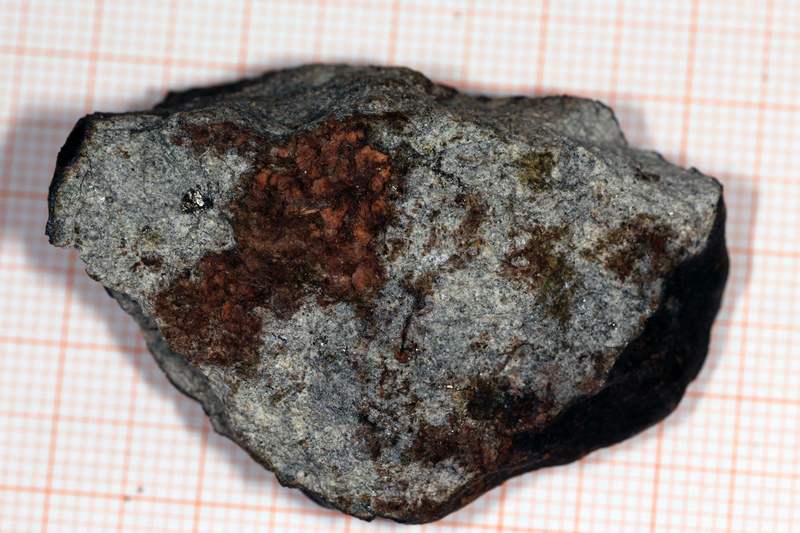 Only highly recrystallized fragments (type 6) were observed, having only very rare, indistinct chondrules. Plagioclase (some >100 μm) and olivine show undulatory extinction, and the olivines show distinct sets of planar fractures indicating that the rock is weakly shocked (S3). Opaque phases include metals (kamacite, taenite), troilite, and chromite. Other accessory phases include Cl-apatite and merrillite. Several shock veins cross the meteorite. Geochemistry: (S. Ebert and A. Bischoff, IfP). The mean composition of olivine is Fa31.4±0.3 (Fa30.5-32.2, n=54). The low-Ca pyroxenes and Ca-pyroxenes have mean compositions of Fs25.4±0.3 (Fs24.8-26.1, n= 43) and Fs11.2Wo41.4 (n=7), respectively. Mean plagioclase composition is An11.1±0.4Or5.5±1.2 (An10.3-12.1, n= 42). Kamacite has mean Ni and Co concentrations of 3.9 and 6.1 wt%, respectively (n=8). The taenite composition is variable, with Ni content varying from 41.9 to 48.2 wt% (mean: 44.3 wt% Ni, ~1.8 wt% Co, n=38). 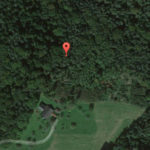 On April 14 Dr. Pavel Spurný published a press release announcing that on April 1, after about 400 hours of systematic search, Ralph Sporn and Martin Neuhofer found a 1320 g specimen (5th find) embedded about 15 centimetres deep in the beech leaf-covered forest soil at location 48°18’20.9″N, 13°05’36.5″E , 515 metres a.s.l. 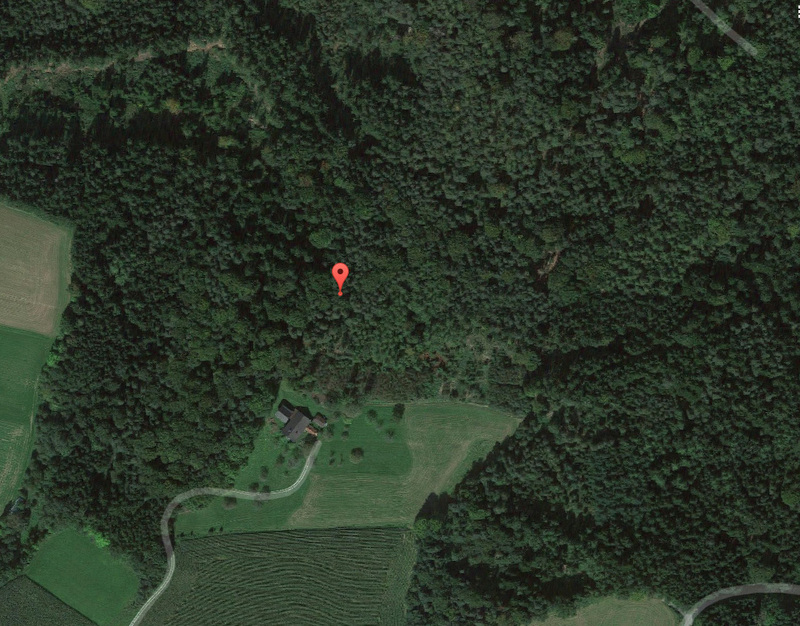 and about 95 metres north-northeast of Kammerhub in the Hösling parcel of the Entenmoos forest at the eastern fringe of the municipality of Stubenberg. 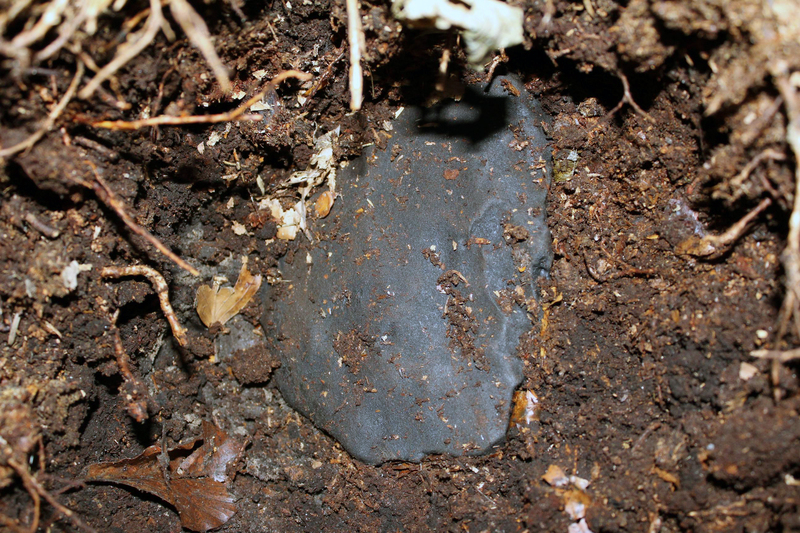 The meteorite was covered by a pine branch which had probably been hit by the falling meteorite and fell directly on the impact pit. On April 12 Dieter Heinlein presented the 1320 gram main mass to Dr. Pavel Spurný, whose precise calculation of the strewnfield in combination with Sporn and Neuhofer’s remarkable search efforts made the recovery of the large mass possible. 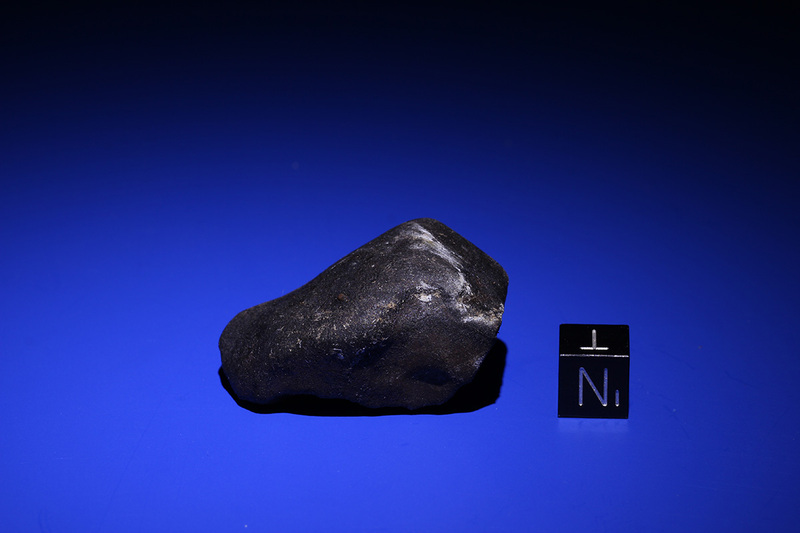 On April 5 Dieter Heinlein announced that in the morning of April 3 a sixth meteorite fragment (~ 4.5 x 3.5 x 2.5 cm) with two fractured faces weighing 35.89 g was found by Dennis H. at location 48°17’53.64″N, 13°05’59.90″E on a footpath on a steep hill in the forest south of Bertenöd. The find was made on the last day of a four-day search in the strewn field and the exact fall coordinates were communicated to D. Heinlein in an exemplary manner. The mass does probably stem from the first or second fragmentation of the meteoroid. 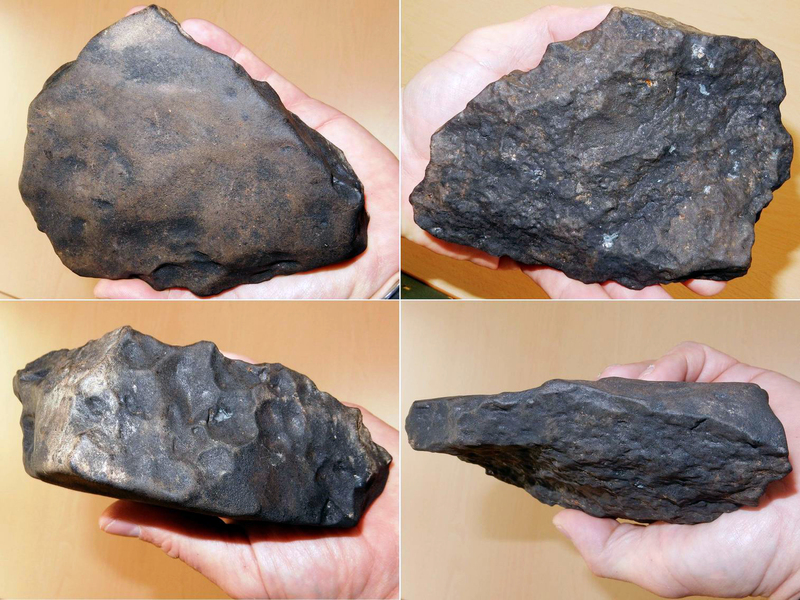 The meteorite has been cut for analysis. The remaining mass of Stubenberg #6 weighs 25.96 grams. 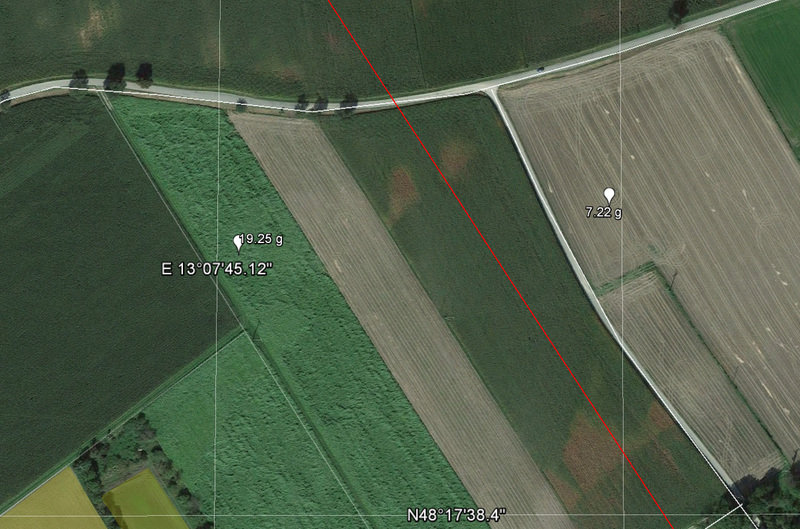 On March 26 at 3 p.m. a fourth and complete specimen (42.43 g) was found by the German meteorite enthusiast Moritz K. in the south of the strewnfield on the German bank of the river Inn at location 48°17’42.86″N, 13°6’59.25″E. 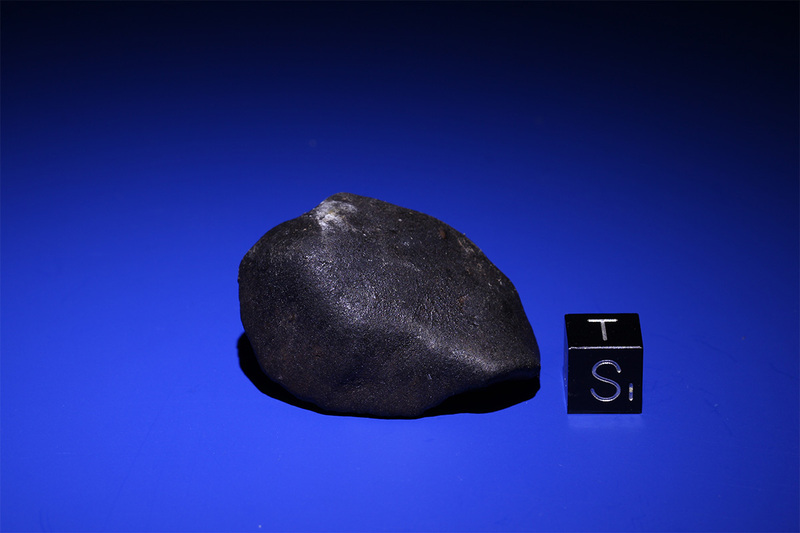 The specimen does probably stem from the first fragmentation of the meteoroid. 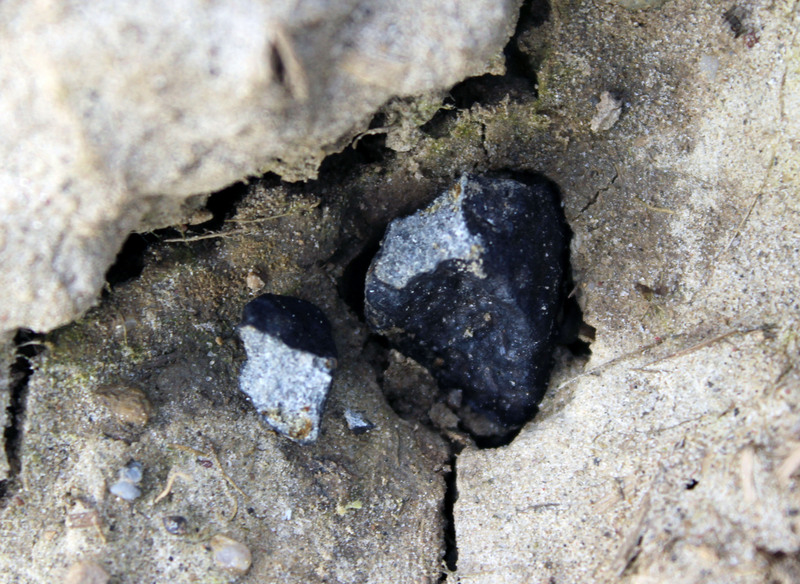 On March 27 it was reported that a second and third meteorite were found in shallow impact pits on two fields in the very east of the calculated strewnfield on March 23. 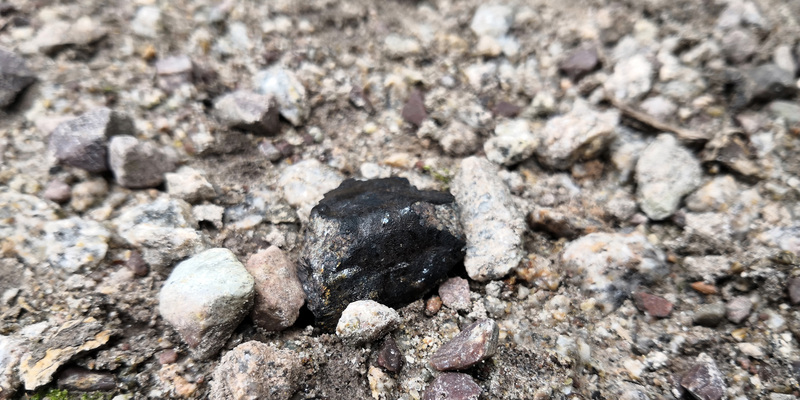 The second meteorite (7.21 g) with a broken edge (0.45 g) was found at location 48°17’44.9″N, 13°07’57.7″E and the third complete specimen (19.24 g) at location 48°17’43.9″N, 13°07’45.8″E. 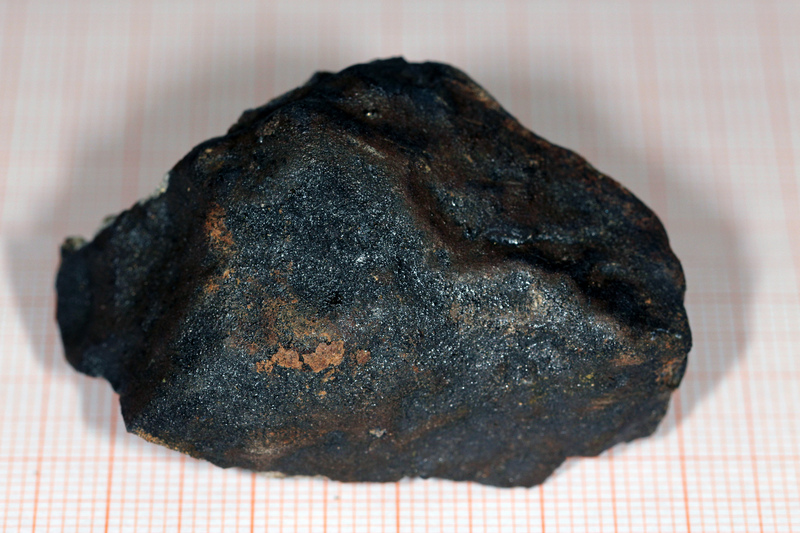 The found specimens do probably stem from the second or third fragmentation of the meteoroid. 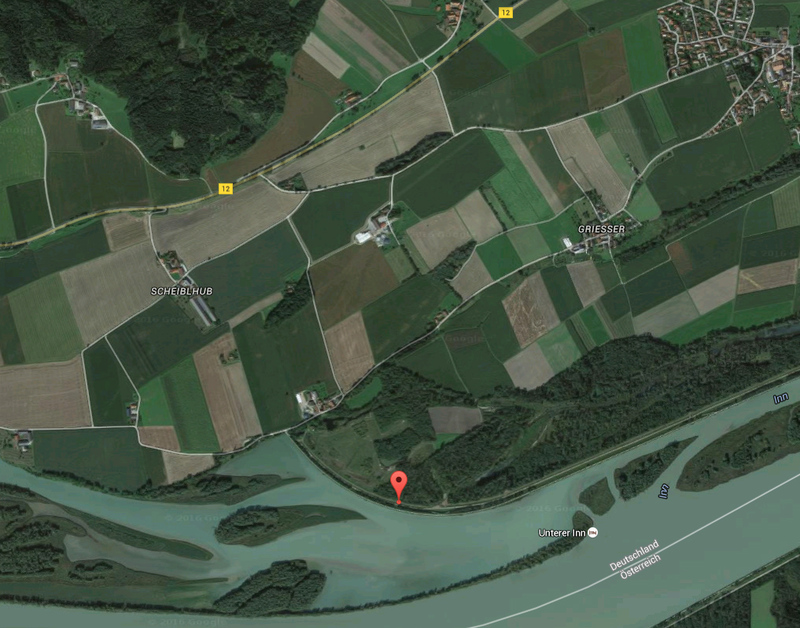 The finders are Ralph Sporn and Martin Neuhofer from Upper Bavaria who found Neuschwanstein II on May 27, 2003. 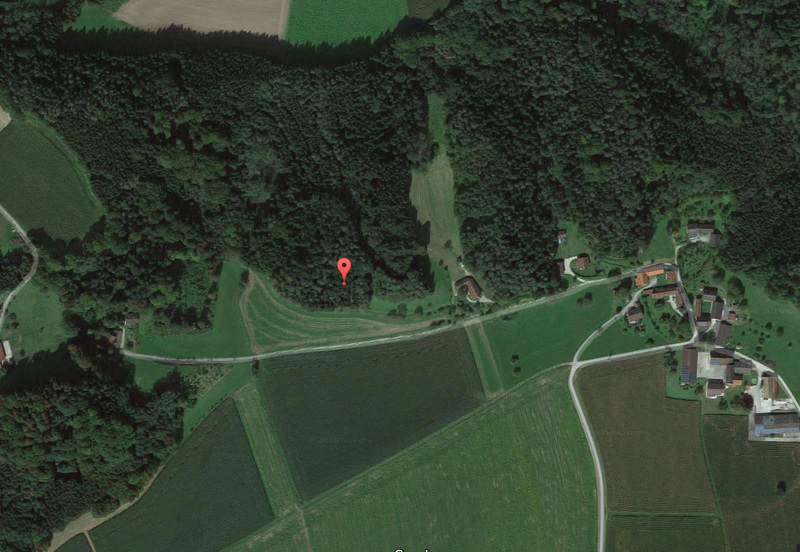 Find locations of the second and third meteorite. 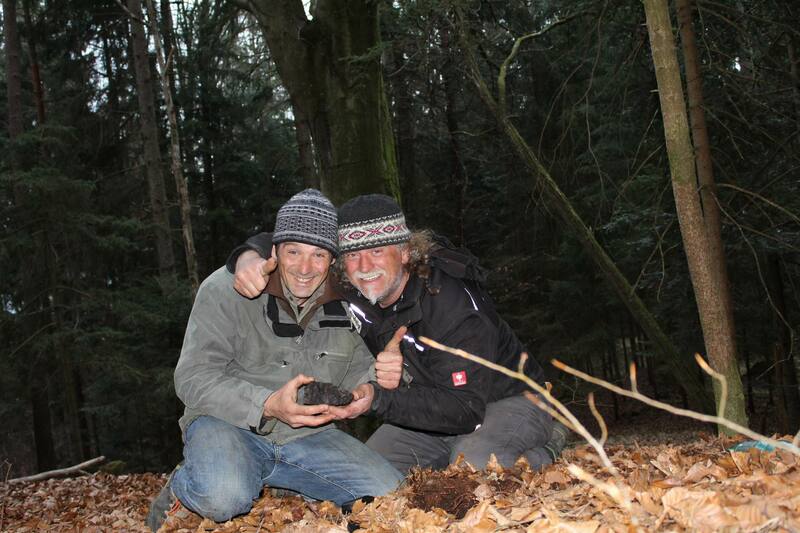 The first meteorite (LL6, S3, breccia) of the fall on 6th March at 9:36:51 p.m. UTC was found on March 12 at 12:05 p.m.. After only two hours and five minutes of searching the meteorite enthusiast Michael Krippner from Austria found the first meteorite fragment, weighing 6.21 grams, in the municipality Ering (Bavaria, Germany) in a field near a small road in the centre of the strewn field. 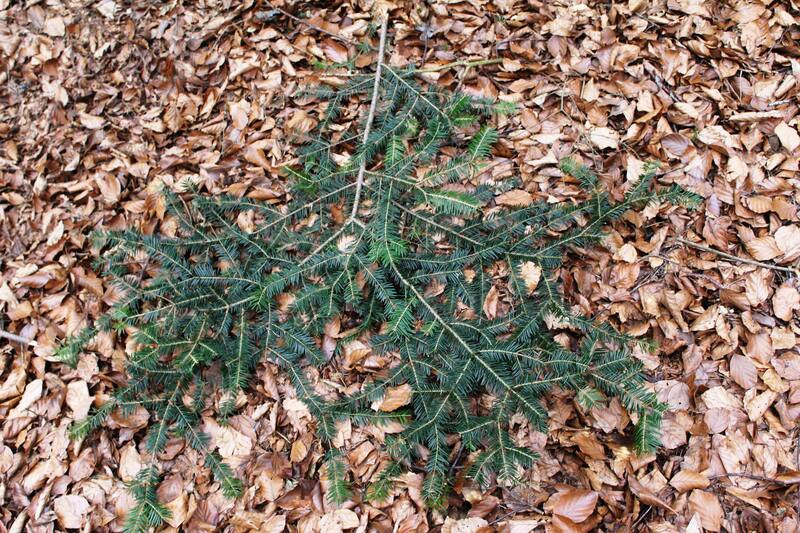 The found specimen does probably stem from the second or third fragmentation of the meteoroid. The strewn field had been meticulously calculated by the Czech astronomer Dr. Pavel Spurný during the five days following the fall. 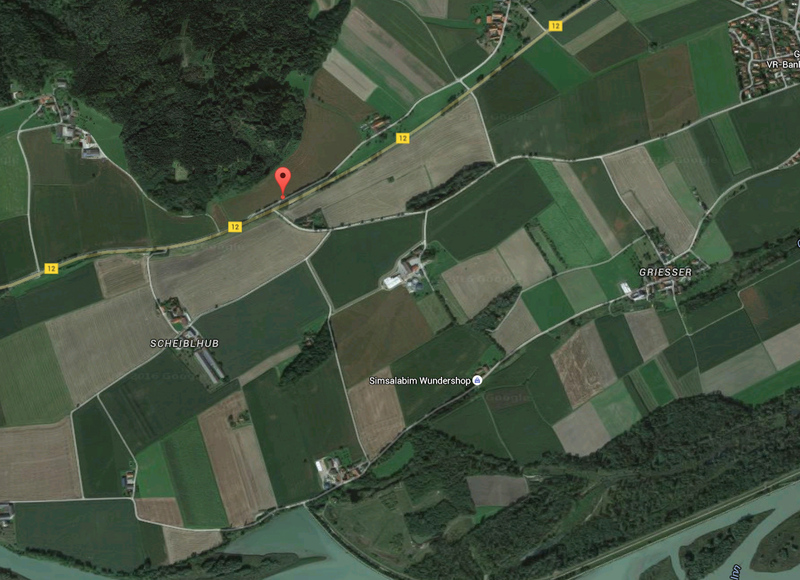 The Austrian finder was a member of a twelve-person Austro-German search team of ambitious amateurs and professionals lead by Dieter Heinlein which had spontaneously gathered within hours as soon as the data of the calculated strewn field were available on March 11. 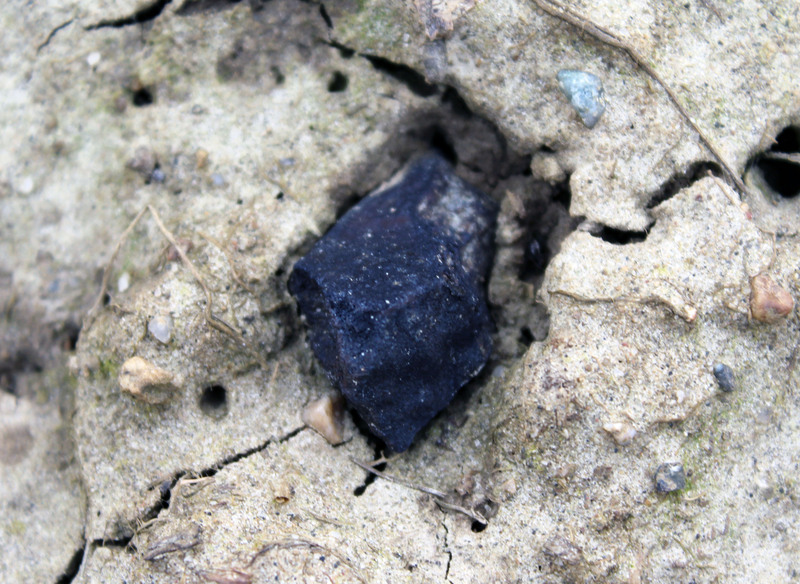 After the first fragment 12 additional fragments (41.67 grams) of the meteorite, which had fragmented on impact, could be collected in the most accessible area of the calculated strewn field on March 12 and March 13. The largest fragment, which was found by Sabine Gumpenberger, weighs 23.58 grams. On March 18 another 2.29 g crusted fragment of the first find was found at the original fall location. All together 14 fragments of the first meteorite with a total weight of 47.88 g could be recovered by ten different finders. 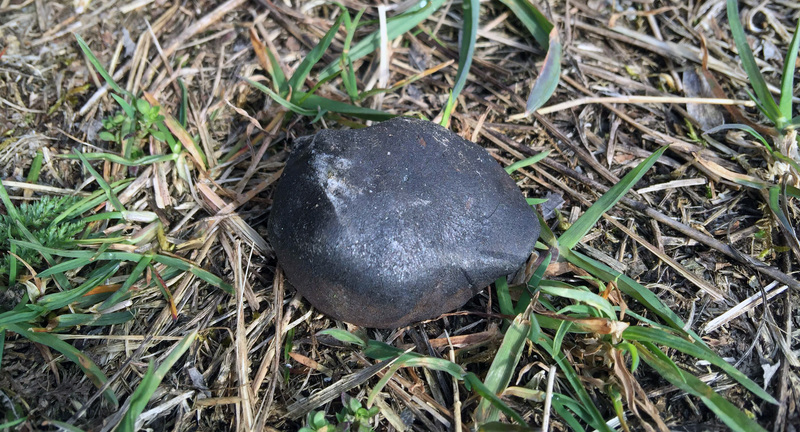 Until 15 April 2016 six meteorites with a total weight of 1473 grams had been found. 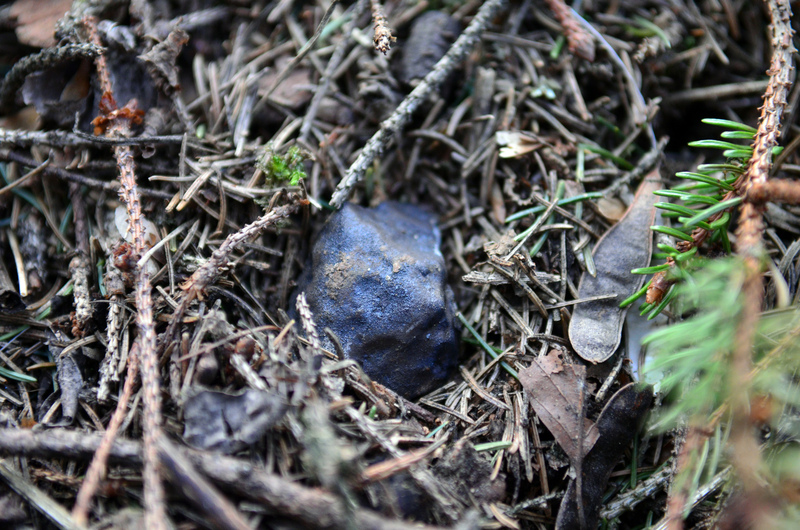 Most larger, and yet not found, meteorites must have fallen in the dense forest east-southeast of Stubenberg. The terrain in the forest is difficult to search: thick layer of foliage or moss, steep slopes, hedged areas, and dense vegetation. 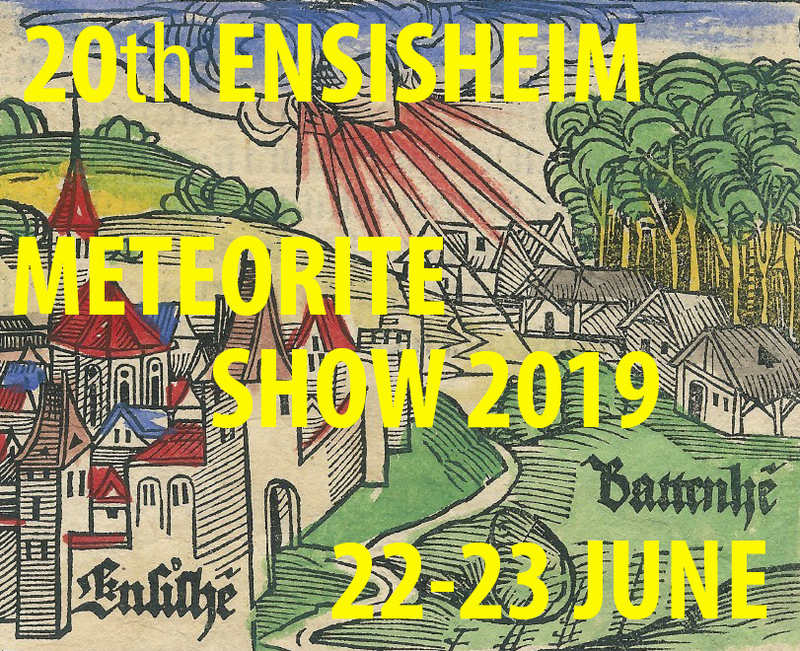 Many fields in the strewn field have been searched, but plowing, sowing and fertilising have already started making finding more meteorites on the fields much more difficult or virtually impossible. On March 17 Dr. Pavel Spurný of the Astronomical Institute of the Czech Academy of Sciences (AsÚ) and the University Münster published press releases with details about the strewn field and the calculated trajectory. CONGRATULATIONS TO ALL WHO CONTRIBUTED TO THIS EXEMPLARY INTERNATIONAL COOPERATION! 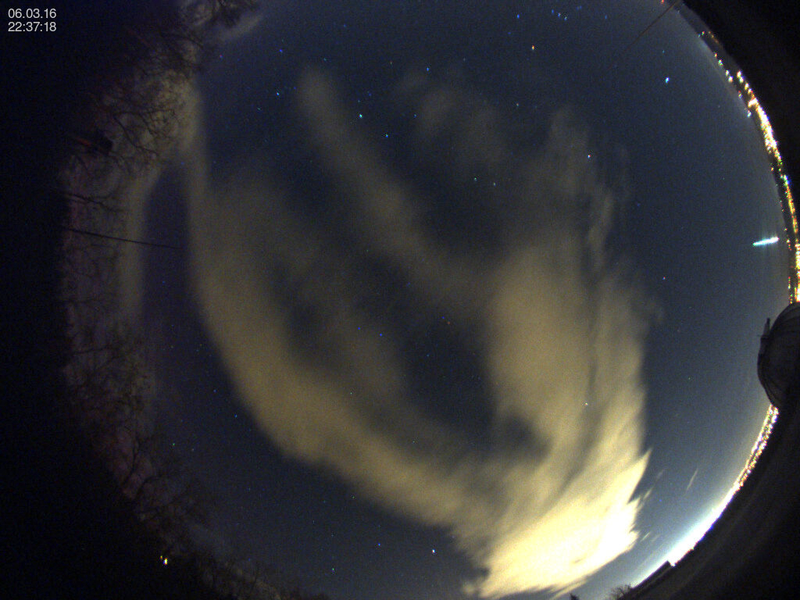 The bolide (EN060316) above the southsouthwestern horizon, captured by the camera of the Czech Hydrometeorological Institute in Kocelovice. (Photo: Astronomický ústav AV ČR). 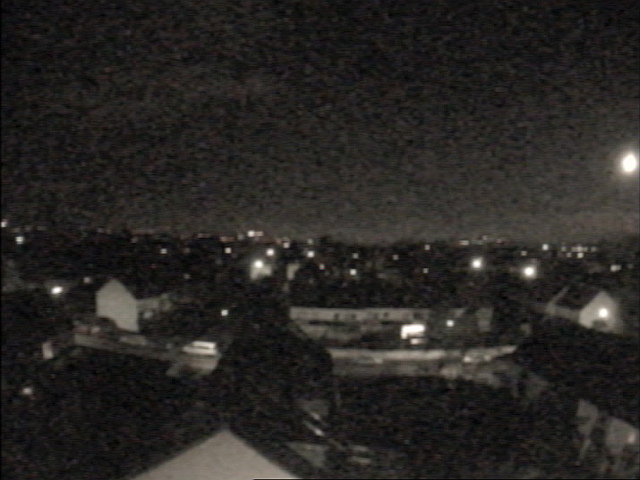 Still image of the video by Martin F. from the Astroclub Radebeul e.V. 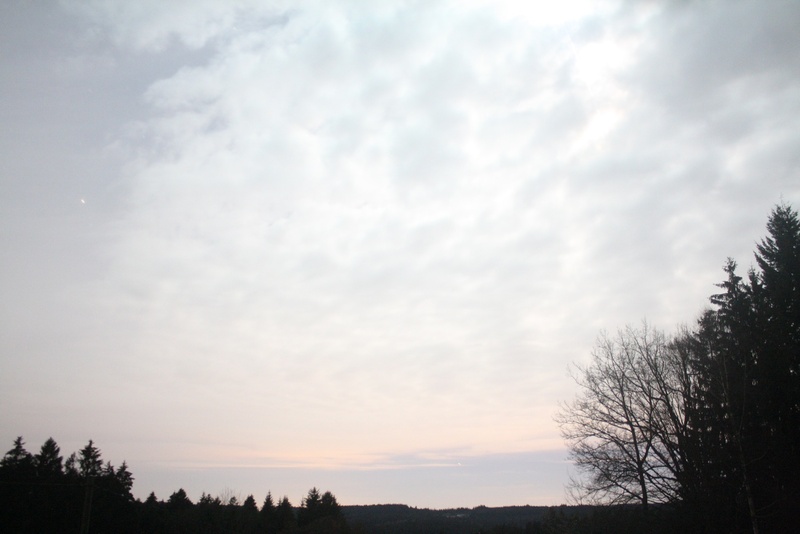 (E13°37´20″ N51°06´59″) / Photo: Martin F.